Nationality: British. Born: Patricia Claire Bloom in North Finchley, London, England, 15 February 1931. Education: Attended school in Cardiff; Badminton School; Fern Hill Manor School New Milton; Dora Russel's School, London; Guildhall School of Music and Drama, London, 1944–45; Central School of Speech and Drama, London, 1945–46. Family: Married 1) the actor Rod Steiger, 1959 (divorced 1969), daughter: Anna; 2) Hillard Elkins, 1969 (divorced 1976); 3) the writer Philip Roth, 1990. Career: 1940–43—in the United States as evacuee: child singer and actress on radio; 1946—radio debut in England in dramatization of Confessions of an Opium Eater ; stage debut at Oxford Playhouse; 1947—West End debut in The White Devil ; short film contract with J. Arthur Rank; 1948—with the Royal Shakespeare Company, Stratford-upon-Avon; 1951—cast by Charlie Chaplin in Limelight ; 1952—debut at Old Vic in Romeo and Juliet ; toured with the same play in the United States, 1956; later stage appearances include The Trojan Women in Spoleto, 1963, A Doll's House in New York, 1970, and A Streetcar Named Desire in London, 1974; work for TV includes the mini-series Backstairs at the White House , 1979, Brideshead Revisited , 1981, Ellis Island , 1984, Queenie , 1988, and Camomile Lawn , 1992. Awards: Most Promising Newcomer, British Academy, for Limelight , 1952. Agent: Marion Rosenberg Agency, 8428 Melrose Place, Suite C, Los Angeles, CA 90069, U.S.A. Limelight and After: The Education of an Actress , London, 1982. Leaving a Doll's House: A Memoir , New York, 1998. "A Star without the Limelight," interview with P. Baker, in Films and Filming (London), March 1956. "The Year of the Steigers," interview in Cinema (Beverly Hills), March 1966. "Charles the Great" (remembering Charles Chaplin), in Vogue (New York), December 1992. Cover story in Time (New York), 17 November 1952. Current Biography 1956 , New York, 1956. Films and Filming (London), February 1956. Ciné Revue (Paris), 20 December 1979. Bohlen, C., "New Voices for Two Silenced Russian Poets," in New York Times , 24 January 1993. The screen persona of Claire Bloom has most often emerged as a blend of regality and vulnerability. This combination of traits manifested itself in the role of Terry, the ballerina heroine of Charles Chaplin's Limelight . Although the 1952 film did not mark her film debut (she had appeared in The Blind Goddess four years earlier), Limelight earned Bloom an international reputation. That she perceives this film as the real beginning of her career is evident from the title of her autobiography published in 1982, Limelight and After: The Education of an Actress . Bloom's regality has characterized her performances in films ranging from Richard III , in which she played opposite Laurence Olivier, to Clash of the Titans , a Ray Harryhausen fantasy in which, as the goddess Hera, she again appeared opposite Olivier as Zeus. Vulnerability is the dominant trait of Bloom's parts in such films as The Outrage , Martin Ritt's Old West remake of Rashomon , Akira Kurosawa's study of shared guilt in feudal Japan. Perhaps Bloom has been at her most effective when a role allows her to merge the two traits. The Limelight part benefited from such an amalgam as did her characterization of Theodosia, the lesbian psychic in The Haunting . Based on a horror novel by Shirley Jackson, Robert Wise's film required Bloom to dominate such characters as Julie Harris's neurotic spinster while maintaining a somewhat subservient stance in relation to the mysterious—and, at times, frustratingly unseen—force that pervades the film's Val Lewton-ish milieu. Bloom's continuing appearance in classical stage roles has definitely contributed to her screen presence. She has acted such Shakespearean parts as Juliet and Ophelia as well as modern roles such as Blanche DuBois in A Streetcar Named Desire . Still in demand for screen work by important contemporary directors, she has appeared recently for Stephen Frears in Sammy and Rose Get Laid and for Woody Allen in the ensemble cast of the seriocomic Crimes and Misdemeanors , as well as in Allen's Mighty Aphrodite . Earlier, she essayed the role of the American divorcée who captures the heart of British writer C. S. Lewis (Joss Ackland) in a television version of William Nicholson's stage drama Shadowlands— but for Richard Attenborough's 1993 film of the play, the role was taken by Debra Winger. 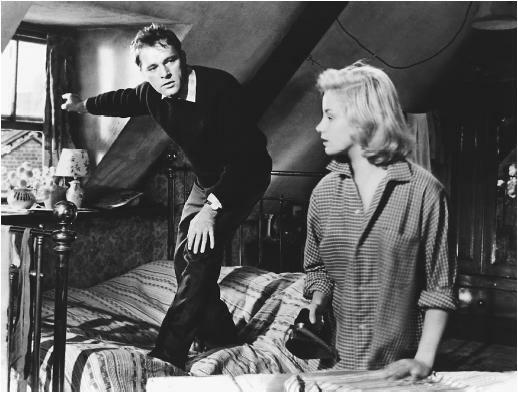 Bloom's most memorable on-screen partner, however, was Richard Burton, with whom she made three films: Alexander the Great , Look Back in Anger , and, most enduringly, The Spy Who Came in from the Cold , based on John Le Carré's gloomy tale of love doomed by the duplicities of East-West espionage.